Should make approximately 8 cakes. Mix the crab, red pepper, onion, bread crumbs, mayo, salt, pepper, and Bravado Spice Jalapeño & Green Apple Hot Sauce together in a large bowl. Add more bread crumbs if too wet, add more mayonnaise if too dry. Form patties either with your hands or with a mold and set aside. Preheat your oven to 375° F.
Pour about 1/4 of oil into a frying pan and heat over medium to medium-high heat. 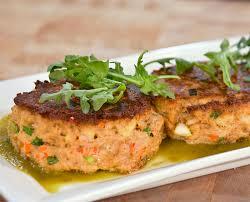 Place the crab cakes in the pan, four at a time and pan fry on both sides until golden brown. Transfer the crab cakes too a baking sheet and bake for about 5 minutes or until done. Serve with Bravado Spice Jalapeño Green Apple hot sauce as a dipping sauce!